There are a lot of options when it comes to picking the best packers and movers, thus the perfect moving company. How do you know which one is right for you? 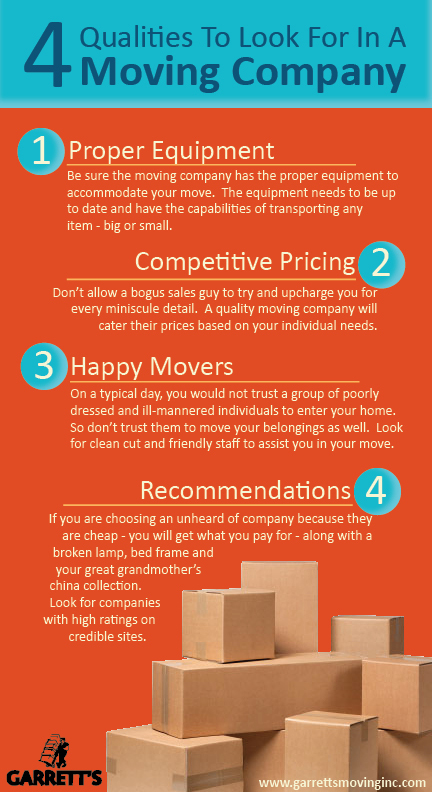 Here are 4 of the essential qualities to look for in a moving company. Packers and Movers: Do They Have The Right Stuff? Having the proper equipment includes having the right kind of boxes and protection for your belongings. Choosing the right packers and movers includes making sure they plan to use the right kinds of paper, padding, etc. Your belongings might need to be stored for a time before moving, and making sure that they are properly protected is part of the packers and movers’ job. Ask your consultant what they typically bring to a job. Do they have specific boxes for your clothes you hang in the closet? How about heavy duty boxes for dishes and other glass bowls? What are their plans for moving and storing fire arms and ammunition? Is this something they’re going to handle, or do you need to account for this? Considering these questions in advance regarding your packers and movers is very important to ensure you have a great move. When you’re talking to references, make sure to ask them about the packing and moving process. Did the movers put adequate paper and padding around your belongings? Did they care for your items the same way you would if you moved yourself? What types of things do you wish they did differently? Which items did you choose to move yourself and why? What other companies did they consider and why didn’t they choose them? If you’re looking for quality movers to assist your move, turn to Garrett’s Moving and Storage. We’ve been moving customers across the Dallas-Fort Worth Metroplex — and across the country — since 1992. Let us work with you! Request your free moving consultation today!